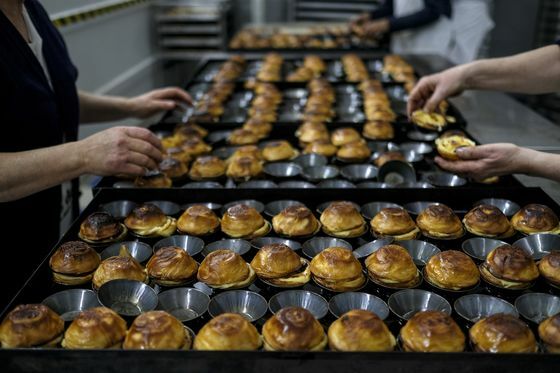 (Bloomberg) -- An unlikely dessert is on its way to becoming as ubiquitous as the croissant. Not long ago an authentic pastel de nata—the diminutive egg-custard tart with a crispy crust—required a trip to Portugal. But now they’re popping up in supermarkets, coffee shops and bakeries from Manhattan to Singapore. The pastry even earned its own episode on the Great British Bake Off, the global hit that conquered the world with bunting and scones. The pastel de nata, which just means cream pastry in Portuguese, has similarly become an international hit, centuries after it was said to have been invented in a Belem monastery by monks. 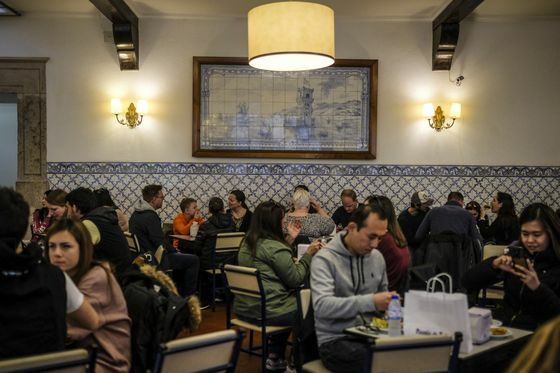 In Portugal, the simple treat often costs about a euro ($1.14) at the more famous shops, but they fetch up to 3 pounds ($4) in trendy London cafes. One grocer, Lidl, boasted of selling 2,000 nata an hour in the U.K. in 2018, competing with doughnuts for popularity. In Manhattan, chef George Mendes introduced the dessert a year and a half ago at his Michelin-starred, Portuguese-inspired Aldea. Not everyone’s familiar with it—yet. For anyone new to the nata: Don’t use a knife and fork. “You’re supposed to eat it with your hands,” Mendes said. “Preferably with a cup of coffee.” Even Mendes says he’s stunned by the dessert’s meteoric rise. Less than a decade ago, pasteis de nata—the plural—were languishing in obscurity. Sure, they flourished in pockets of the Portuguese diaspora in places like Newark, New Jersey. Mendes discovered them growing up in Danbury, Connecticut, which has a significant Portuguese community. His mom would bring them home after church from a nearby Portuguese bakery. But as recently as 2012, Portugal’s then-economy minister lamented that they weren’t an internationally known export. It’s unclear what exactly sparked the boom, but the pastry ticks a few boxes. Culturally, Portugal is a must-try on an international travelers’ bucket list, and budget Lisbon rents are creating a tech hub for millennials priced out of London and New York. The famous, blue-and-white-tiled Pasteis de Belem was made for Instagram bragging, despite being founded in 1837. Perhaps unsurprisingly, the nata’s rise is fueled in part by promotion from the government, which sponsors events like the 2018 Nata Festival in London and funds local businesses. Exports of Portuguese specialties, meat and livestock to other European countries topped 1 billion euros in 2016, more than doubling in seven years. In the last three years, the Portuguese government has spent €50 million per year overseas promoting the country and its products. But there’s also a more unlikely source of promotion: a tiny business called Nata Pura that sought to do for natas what Dunkin Donuts did for doughnuts. Started in 2013, the company has rapidly expanded, helped by a six-figure investment from Portugal Ventures, an investment firm backed by government agencies. Founder Mabilio de Albuquerque took a page from international brands like McDonald’s and adapted the pastries to local tastes: matcha green tea and passion fruit for Japan; Brie, Camembert and blue cheese for Paris. He knew his Portuguese friends would be furious. The original nata made with eggs, flour, milk and butter was sold for centuries without an alteration, and its recipe was feverishly guarded. But de Albuquerque wasn’t trying to please a Portuguese audience. He was creating a brand of nata he could export to the world with his startup Nata Pura from Asia to Europe, to Latin America and eventually the U.S.
Nata Pura wasn’t the first to try to export the pastry, but it was the first to do it in such a methodical way, says Susana Costa e Silva, who teaches the company’s strategy as a case study at Portugal’s Catholic University. The small company—it only had five employees in 2017—hired marketing and branding professionals, something others hadn’t done, and found foreign partners to help fuel expansion. Nata Pura received enthusiastic reactions at a food fair in London, where de Albuquerque sold it as a luxury but affordable product with a special history. It held pastry tastings and sponsored events like the London Coffee Festival and BBC Good Food. 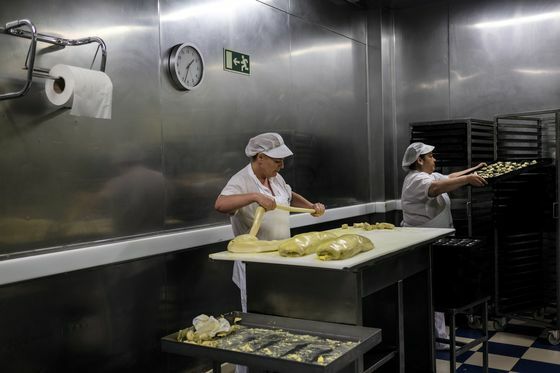 The company now sells about 500,000 natas a month in 5,000 stores around the world. De Albuquerque says sales are between 1.5 million and 2 million euros a year, and he expects that to double this year. More than a third of their business comes from South Korea, where one of their customers, the CVS chain, will offer them in 12,500 stores. For now, Mendes thinks he’s the only high-end chef offering it in Manhattan. He says he won’t be surprised if it becomes more common.